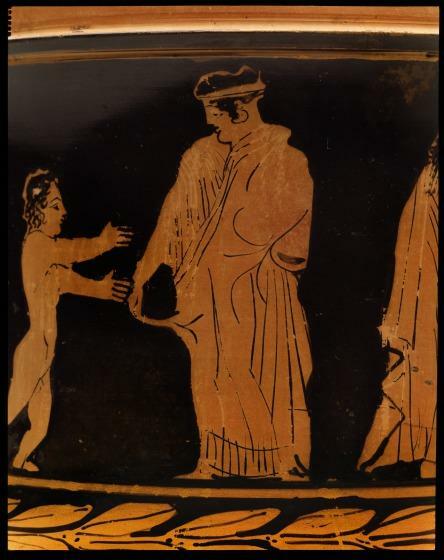 In the ancient Greek city-state of Athens, as well as the Greek world in general, men and women lived separate lives. Men lived in the public world of politics, war, business, courtrooms, and schools. Women, especially the respectable and well-to-do, were expected to live in the private world of the home—preparing food, raising children, producing textiles, and maintaining the household. 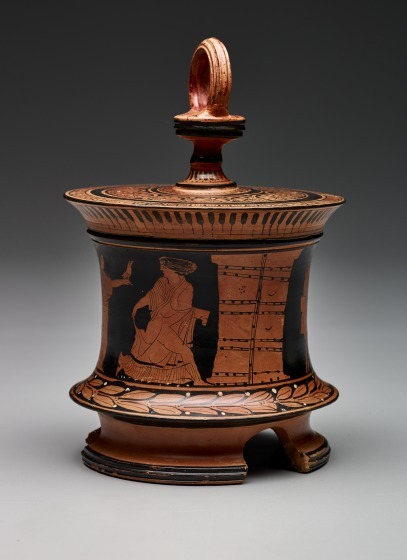 This red-figure pyxis displays a scene from the world of women and the home, the domestic interior indicated by the items hanging on the wall—the pet bird (an allusion to a life of leisure), the furniture, but most importantly the closed door. 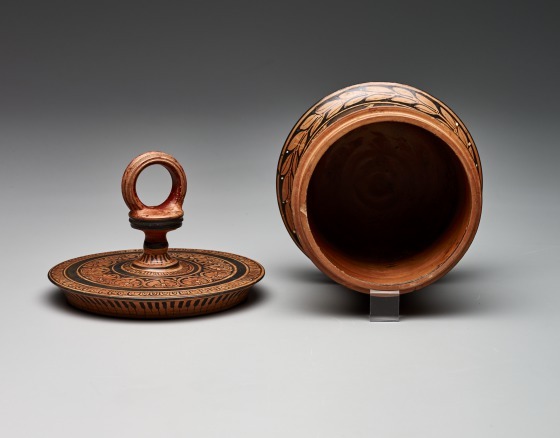 The gynaikeia, or women's quarters, is an appropriate subject for this vase shape, as it typically functioned as a container to hold jewelry, incense, medicine, and cosmetics for women. 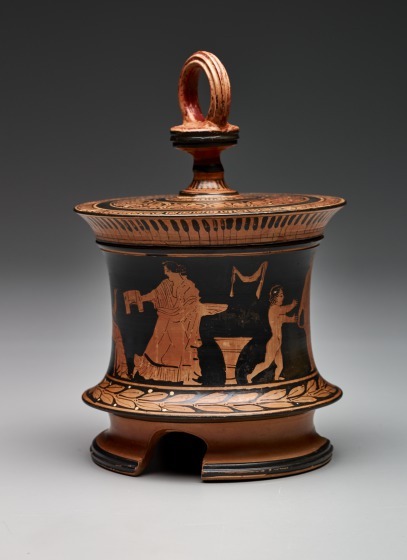 The pyxis was also commonly decorated with scenes relating to and focusing on marriage. In this way, the closed door seen here may have a more symbolic meaning than simply an indication of an interior setting. By the middle of the 5th century BCE, depictions of wedding processions show that the bridegroom's house has been reduced to double doors symbolizing not only the threshold of the family homestead but also the portal of transition for the bride from maid to matron. 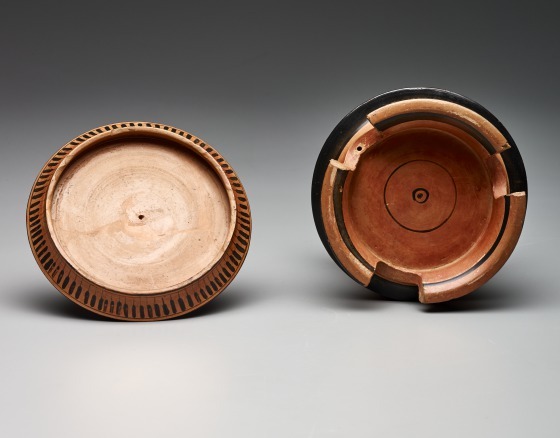 The scene here also acts as a reassurance to the young bride's future camaraderie in her life, and the assumption that she, too, would now have prized possessions to keep safe and private within such an elegant container. 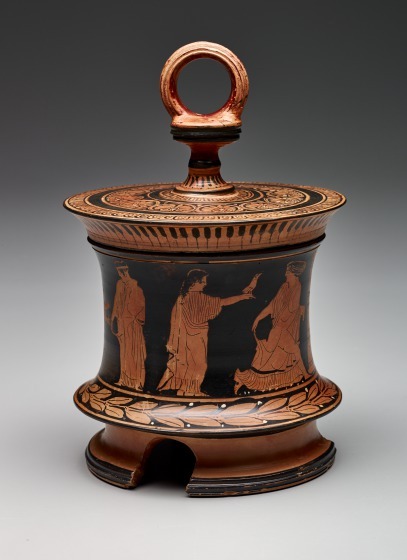 This pyxis also could function as a subtle advocate for the privacy a woman should value and the discretion she should consistently practice. 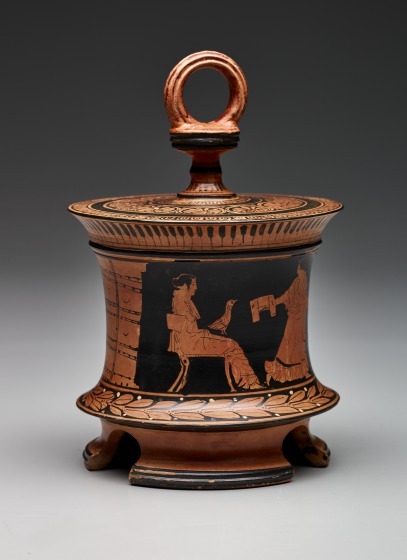 Anne R. Bromberg, and Karl Kilinski II, Gods, Men, and Heroes: Ancient Art at the Dallas Museum of Art. (Seattle: University of Washington Press, 1996), 69-70. 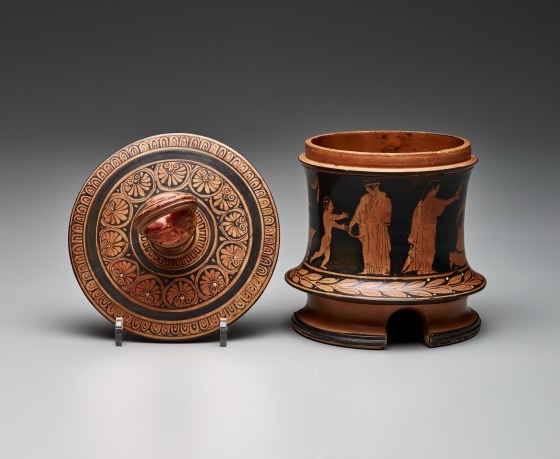 In ancient Greece, vessels and containers were sometimes a metaphor for women and the supposed nature of the female, whom the Greeks believed to be alluring despite her flaw of deceit. The mythological story of Pandora and her box embodies this idea as the first woman on Earth. Sent by Zeus as revenge for man's stealing fire from the gods, Pandora unleashed a plague of troubles when she could not resist opening a beautiful box given to her by the gods.